Finding spaces: how much does a mobile classroom cost? As a general guide, mobile or modular classrooms cost somewhere in the region of £850.00 per square metre (sqm) depending on exact specifications, with total costs for a double classroom modular building ranging between £85,000.00 and £120,000. Certainly if you’re thinking of a traditional build then challenges laid out above are potentially extremely problematic but, if you’re short on space or time, a modular classroom could be the right solution for you as approximately 90% of the construction takes place at the factory, minimising time on-site and any potential disruption. Often school expansion projects need to be delivered by the start of the new academic year and this puts increased pressure on traditional building contractors working in the education sector – timings can slip as they juggle multiple projects and inclement weather causes previously unforeseen delays. When you think of a mobile classroom it probably conjures up images of metal portable buildings like shipping containers but today’s modern portable buildings are available in a whole range of styles, finishes and cladding options to blend into any traditional or contemporary surrounding. A modular classroom building can be installed and ready-to-go in a matter of weeks, so could easily be craned into position during one of the school holiday periods as the construction and fit out can all be carried out off-site prior to the install. This reduces the impact to school operations and any other scheduled site activities, minimising disruption for both school and pupils. 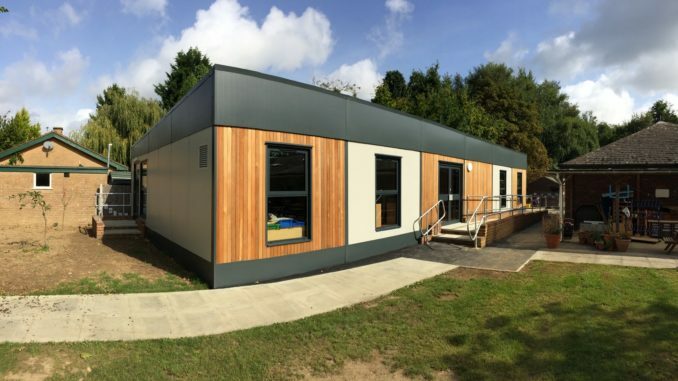 Flexibility is a key consideration for many schools and modular classroom buildings can be configured to suit any current requirement such as science block, drama studio or IT suite, and be reconfigured later as demand changes. Each modular classroom is moveable, stackable and can be repurposed, making it the ultimate in flexible, future-proof school infrastructure. Modern modular classrooms are also highly durable, designed to last for up to 50 years. Using the latest technology and materials, modular classroom buildings are also highly energy efficient, keeping pupils warm and energy bills low for the long-term. According to an article on the cost model of primary schools in 2013, an example ‘low cost’ 4000sqm primary school built on a greenfield site in the South East of England, had predicted costs of £1497.50/sqm for construction (building) only with a projected construction period of 56 weeks. In terms of modular portable classrooms, buildings can be hired or purchased outright as either new or refurbished so there are lots of different ways to maximise stretched budgets. It’s worth bearing in mind that mobile classrooms can be fully customised to meet your requirements for space and amenities so costs will vary depending on the exact specification required. However, it is likely to be around 50% cheaper than a traditional build and at least 70% quicker to complete. Planning an expansion to your school or academy? For a more detailed costing, contact us on 01420 587 880, or visit Portable Facilities. Based in Hampshire, Portable Facilities has been providing high-quality, flexible accommodation solutions to businesses and Schools around the UK since 2005. Our knowledge and expertise, along with our competitive prices, means we can satisfy a diverse range of customer requirements. Our company ethos is to provide high-quality accommodation at excellent value for money. Through a combination of our own stock and our trade contacts, we have the flexibility and experience to supply, deliver and install a range of new, used and refurbished Modular School Buildings on time and on budget. “Portable Facilities have recently completed a refurbished building project consisting of two classrooms and a toilet/cloak area. As a school we had to balance our wishes for a well-structured building with the reality of cost, at a time when school funding is the lowest it has been for decades. We knew the type of building we wanted and had engaged with several other providers before finding Portable Facilities. From the very first phone call I knew I wanted to work with Richard and his team due to the incredibly warm and welcoming manner I received. The information Richard sent over, including pictures of a recently delivered project, was thorough and our initial meeting followed by reasonable quotation secured our business. “Richard and his team worked incredibly hard to ensure our project, working at tight timescales, could be delivered punctually, offering professional judgements and solutions to issues. Throughout the build Portable Facilities liaised with all services proficiently, always ensuring communication with the school was high priority. All services worked well together and were delivered promptly with any problems being dealt with professionally and efficiently by Portable Facilities. I had prepared myself for a period of disorder and interruptions and was pleasantly surprised to see Portable Facilities take care of anything that cropped up meaning I could enjoy watching the project come to fruition. “Knowing that the building was to be a refurbished modular build I was incredibly shocked to see the units come together, looking brand new! The quality of refurbishment is incredible, both the inside and outside being attractive and robust. The classrooms, although being the same size as many of our existing, feel larger and more spacious with a pleasing amount of light. The acoustics on the building are notably superior than in other buildings, extremely beneficial for a class with young children. All fixtures and fittings are of high quality and the general feel of the building promotes calmness and order. It almost seemed a shame to add the furniture and display boards however the injection of colour from the day to day classroom environment has only added to the atmosphere. “I fully recommend Portable Facilities to any school that are looking to replace or add a modular classroom on their school site. Although it is a ‘refurbished’ building and only costs a fraction of a new mobile, it doesn’t feel refurbished at all! From the initial meeting through to planning permission and snagging Richard and his team were exemplary. I never felt like just another customer to Portable Facilities, instead we felt like a team from the very beginning. There were no surprise bills or added items that weren’t previously discussed and, if anything, Richard was always trying to keep costs low for the school. Richard made sure everything was of the highest standard and dealt with any emergencies that so often crop up with projects like this. For more information and a detailed costing, contact Portable Facilities on 01420 587 880, or visit Portable Facilities. Got a problem? Take it up with tech!